This system supports Bluetooth®, which allows you make, receive calls without using cables to connect cellular phone, the system, and without operating cellular phone, owners of models equipped with a navigation system should refer. Adding an entry to the phonebook (Up to 20 names can be, n Operating the system by using voice, n Using the hands-free system, n Menu list of hands-free phone system. N Dialing by inputting number, n Dialing by inputting name, n When receiving phone call, n Using call history memory. 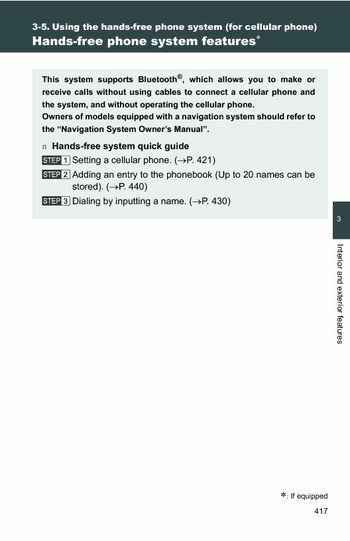 N Selecting the cellular phone be used, n Listing registered cellular phone, n Turning the hands-free phone automatic connection on/off, n Locking or unlocking phone book. N Adding new phone number, the hands-free phone system may not operate normally following situations, l The cellular phone is turned off, or located outside service area, l The cellular phone has low battery. L The cellular phone is not connected system, l The cellular phone is behind the seat or in the glove box, or metal material covers touches phone, n When transferring ownership vehicle, be sure to initialize the system to prevent personal data being improperly accessed. N Required profiles cellular phone, l OPP (Object Push Profile) Ver, n For detailed information about Handsfree Phone System, for assistance with pairing and operating your cell phone, go website. N Certification for hands-free phone system, this device complies with Part 15 of the FCC Rules RSS-210 Rules, operation is subject to the following two conditions; (1) This device may not, cause harmful interference, and (2) This device must accept any interference received, including interference that may cause undesired operation. L HFP (Hands Free Profile) Ver, changes or modifications in construction not expressly approved by, party responsible for compliance could void the user's authority operate, only and, to comply with applicable FCC radio frequency exposure regulations, must be used with a distance of at least 7. Antenna and the body of any person at all times during use, n To prevent damage cellular phone, do not leave a cellular phone in the vehicle, become high resulting in damage phone. Bluetooth® connection condition reception level, turns the hands-free system off/ends call/refuses, turns the hands-free system on/starts call, operating the system by using voice command. By following the voice guidance instructions output speaker, voice commands enable the operation of the hands-free phone system without the need to check display operate, n Operation procedure when using voice command, press the talk switch and follow voice guidance instructions. N Auxiliary commands when using voice command, the following auxiliary commands can be used when operating, using the hands-free phone system first time, before using the hands-free phone system, it necessary register. A cellular phone in the system, entered automatically when starting the system with no cellular, press the off-hook switch talk switch.